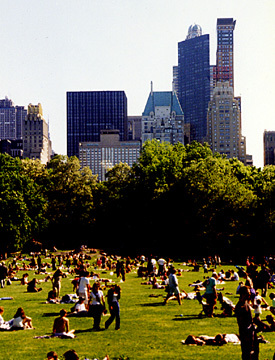 Central Park is the city's principal oasis, a swath of largely undeveloped but landscaped land half a mile wide and two-and-half miles long that separates the Upper East and Upper West Sides of Manhattan and forms the northern boundary of midtown and the southern boundary of Harlem. The city is celebrating the 150th anniversary in July, 2003, of the passing of state legislation to authorize funding for the acquisition of its land. The "anniversary" is not terribly important: the concept of such a major urban park had been put forward about a dozen years earlier by William Cullen Bryant, the writer and naturalist and friend of Hudson River School painter Thomas Cole; Frederick Law Olmstead and Calvert Vaux won a design competition for the park in 1857; and construction began in 1858. This year's celebration, of course, is not unwelcome. The park has gone through a lot of changes and good periods and bad periods and in recent years has perhaps never looked better, thanks in large part to the efforts of the Central Park Conservancy, a private organization founded in 1980, a time when the park's fortunes and conditions were low. The city, of course, is suffering through a long and severe recession and no turnaround is yet in sight even though new construction projects in recent years have significantly altered the skyline that frames the park, most notably the Columbus Center project incorporating the AOL-Time Warner corporate headquarters, the Jazz Center of the Lincoln Center for the Performing Arts, a Mandarin Hotel, a large luxury retail base and a couple of hundred luxury condominium apartments on the former site of the New York Coliseum at Columbus Circle. 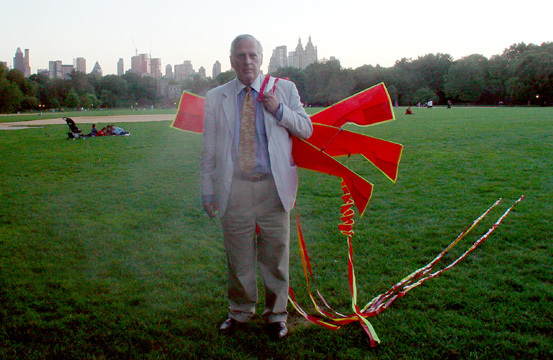 The project's twin towers are quite large and the project has had a controversial history including protests against a former design's shadows in Central Park. 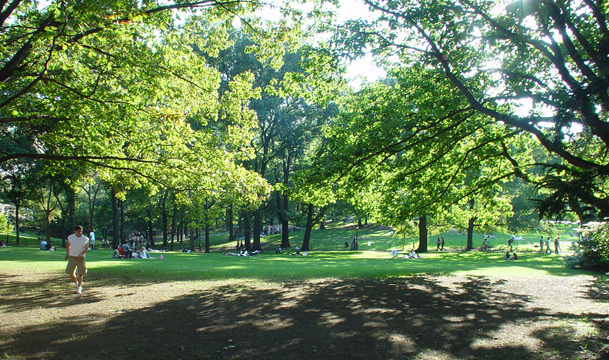 Although the notion of a large urban park may not have originated with Central Park, it has become the world's most famous such "amenity" - a bucolic, rustic, romantic folly in which to escape the hurly-burly of urban life. While Central Park may not top everyone's list as New York City's most important "treasure" or asset, losing out to its skyline, its street grid, its museums, its restaurants, its energy, its financial markets, its media markets and the Statue of Liberty, it is without question one of its most important components. In their 1858 "Greensward" plan for the park, Olmstead and Vaux proposed that the "heart of the Park" be a promenade, or mall, whose north end culminated in a "concert ground" and a Terrace overlooking the lake. 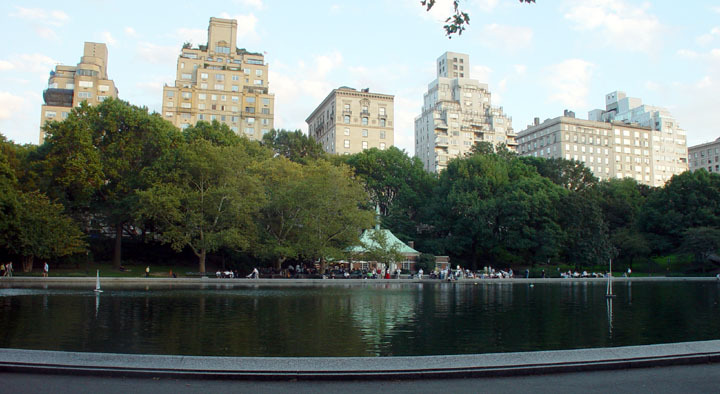 According to the Central Park Conservancy, the non-profit organization created in 1980 to maintain the park, originally there was "an ornate cast-iron Bandstand" surrounded by "urns and filigreed metal bird cages, ornamental drinking fountains, and display fountains. The present bandstand, known as the Naumburg Bandshell, was built in 1923 to replace the earlier one and became the subject of a major controversy when the conservancy sought to demolish it and replace it with a modern facility. Happily, the handsome neo-classical bandshell was ultimately preserved. The decorative elements for the Terrace, known as Bethesda Terrace, were designed by Jacob Wrey Mould. 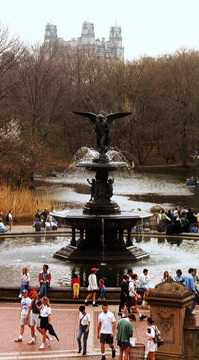 The Bethesda fountain was designed by Emma Stebbins in 1873. The three towers of the Beresford apartment building on Central Park West at 81st Street are at the top of the picture at the left. 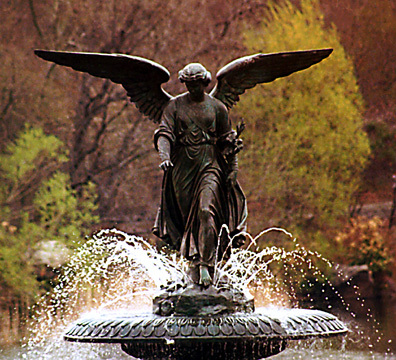 The centerpiece of the lower terrace is the "Angel of the Waters" or "Bethesda" fountain, designed by Emma Stebbins, the sister of Col. Henry G. Stebbins, the president of the Central Park Board of Commissioners. The neo-classical sculpture was dedicated in 1873. The mall is 40 feet wide and flanked by quadruple rows of American elms. Over the years there have been many changes to the park. The park itself originally only extended to 106th Street but was within a few years extended to 110th Street. It has formal spaces such as the Mall or the Conversatory Garden on Fifth Avenue at 103rd Street, but it also has many nooks and crannies. 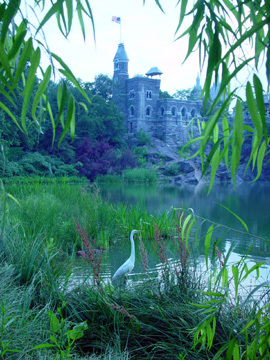 One of the most popular places is Turtle Pond, shown above, at the foot of Belvedere Castle where the "temperature" in Central Park is measured. Just to the north of Turtle Pond, a large "lower" reservoir" was filled in and made into the Great Lawn with several playing fields and the site of many concerts, softball games, frisbee throwing and kite-flying. 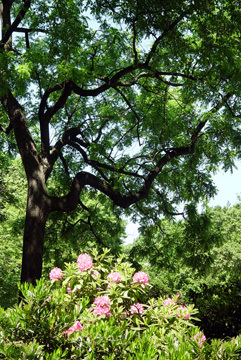 "Shakespeare-in-the-Park" performances take place in an amphitheater, known as the Delacorte Theater, which was named after philanthropist George Delacorte, a publisher, and was erected as a temporary structure in 1962, just to the east of Turtle Pond. The "Sheep Meadow" for sheep housed in the buildings that now make up the Tavern-on-The-Green Restaurant was converted to a 15-acre lawn in 1934 when the flock was transferred to Prospect Park in Brooklyn, which was also designed by Olmstead & Vaux. There are numerous entrances to the park but the most familiar is probably at its southeast corner, shown above, where many horse-and-buggies await tourists and a path to the park's zoo is located. The zoo used to have a wide variety of animals such as hippotami, elephants, gorillas and the like but was rebuilt and most of the exotic animals relocated because of some public concerns that their habitats were not very nice. 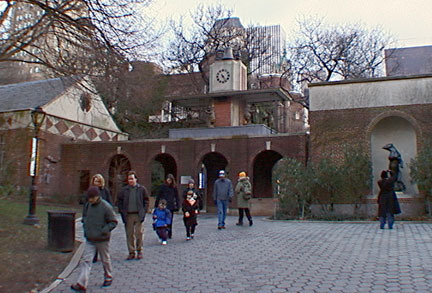 The major entrance to the zoo is at Fifth Avenue and 64th Street behind the formidable and very handsome, Georgian-style Arsenal building, and a smaller Children's Zoo is just to the north and it too was remodeled, albeit not without controversy (see The City Review article). The Arsenal was completed in 1871 as a munitions depot for the state's National Guard. A sail boat pond at 74th Street is another very popular area in part because it is just to the south of one of the park's most beloved and wonderful statues, "Alice in Wonderland," shown below. 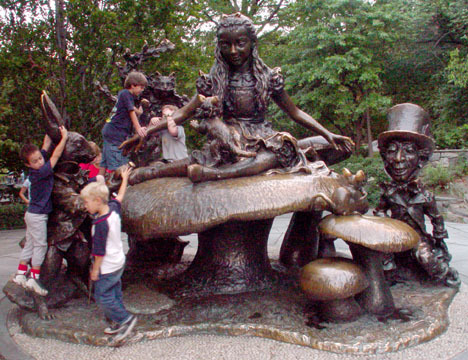 According to the Central Park Conservancy's fine website, http://www.centralparknyc.org, the "Alice in Wonderland" sculpture by José de Creeft is modeled closly on John Tenniel's whimsical Victorian illustrations and Alice "is said to resemble de Creeft's daughter, Donna," and "in the longstanding tradition of honoring a patron within a work of art, the sculptor may have included [George] Delacorte hiumself by way of caricature as the Mad Hatter." In warm weather, one of the most delightful activities is taking a row boat out on the lake just to the north of Bethesda Fountain. There is also a Venetian-style gondola ride available at the Boathouse restaurant and café on the eastern edge of this pond, one of the most beautiful spots in the city for drinks. 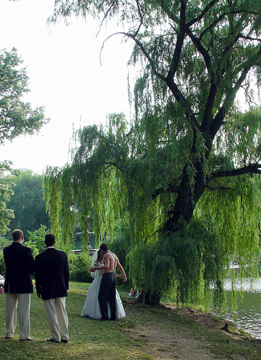 The Boathouse and its surrounding area, shown above, is a popular setting for wedding pictures as is the Conservatory Garden further north, shown below. To the west of the Mall is a very popular roller skating area, which is not too far away from the park's carousel, to the south. The park's first carousel was built in 1870 and reportedly was turned by a flind mule and a horse. The present carousel, known as the Friedsam Memorial Carousel, is the fourth on the site. Earlier carousels were destroyed in fires and this one had been abandoned in the old trolley terminal on Coney Island and had been made by the Stein and Goldstein in 1906. 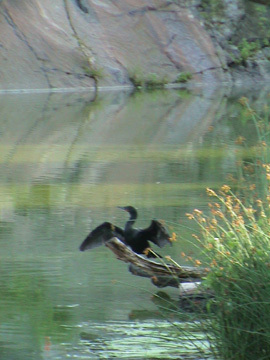 Lovers are not the only people who abound in the park. The park's roadways are closed on the weekends and are used by cyclists and joggers who rarely pay heed to the traffic lights to the great consternation of many pedestrians. 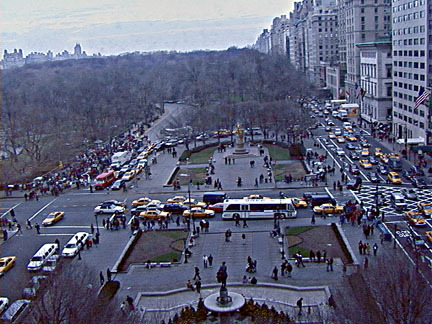 The roadways should be used for many of the city's Fifth Avenue parades, which tie up traffic tremendously. Many of the joggers use the 1.58-mile-long jogging path around the Reservoir rather than the roadways. 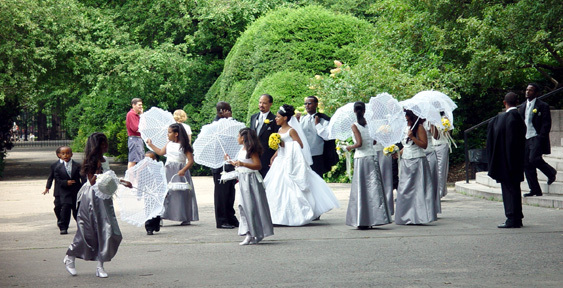 The jogging path is surrounded, on a lower level, by a bridal path. A detail of a bridge crossing the bridal path is shown above. The reservoir holds more than a billion gallons of water and occupies 106 acres. It no longer distributes fresh water to Manhattan. There is a large tennis facilities to the northwest of the reservoir. 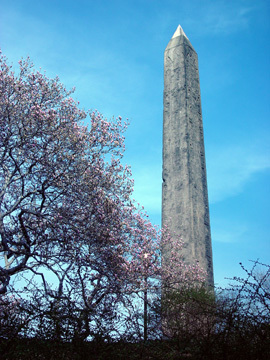 "Cleopatra's Needle," a 71-foot-high Egyptian obelisk, is behind the Metropolitan Museum of Art. It was designed as a tribute not to Cleopatra but Thutmosis III and was erected in Heliopolis around 1500 B.C. and was given to the United States by the Khedive of Egypt in 1879. "After landscape architect Andrew Jackson Downing appealed for a park, the idea caught on, and both mayoralty contestants made it a promise in the 1850 campaign. The winner, Ambrose C. Kingsland, kept his word, and the Common Council took action. The site was then physically unprepossessing; 'A pestilential spot where miasmic odors taint every breath of air,' one report concluded. But it was available. Land was acquired (1856) for $5.5 million and surveyed by Egbert L. Viele. Clearing began the next year: squatters and hogs were forcibly removed, often with the aid of the police, bone-boiling works and swill mills were torn down, swamps were drained, and the omnipresent Manhattan schist was blasted." A competition was held and a plan, known as "Greensward," by Frederick Law Olmsted and Calvert Vaux, was selected over 32 other submissions. Authors Willensky and White also noted that the gravel drives were paved with asphalt in 1912 and the first paved playground was created in 1926. The park has changed considerably, but fortunately not too much, over the generations. There is little question that it is glorious, but there is little scientific explanation for much of its magic. Could it have been narrower or smaller and still have all its charm? Perhaps, but thankfully it is now a landmark and is so beloved that it is unlikely to be ruined. Its maintenance, however, is no small matter and the Central Park Conservancy deserves great credit for its preservation. So bring back an elephant or two and the pony rides and put the major parades on its roadways. 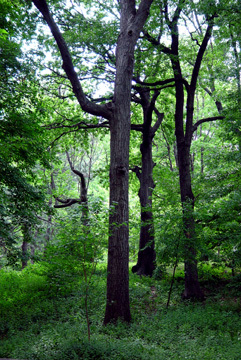 Look at the trees and have a picnic, but don't forget to pick up your trash and smile at the birds and squirrels.